Among the few important relics which had survived from the Aztec empire, one of great interest was discovered by accident in 1790. When the viceroy had ordered repairs to the paving of the great Plaza Mayor to improve the drainage in the front of the cathedral, workmen had struck a large stone below the surface, almost in front of the viceroy's palace. The Stone, a solid piece of gray-black basalt, measured twelve feet across and was almost three feet thick, and weighed about twenty-four tons. It's presence was explained by the fact that when Cortez dismantled the great city of Tenochtitlan he ordered all large statues and stonework too solid to be broken up to be buried so that no remnant of the great Aztec capital be left to remind the Aztecs of their former glory. The clergy also consider the sun stone a "sacrificial altar," and wanted to bury with the stone, "the memory of the detestable acts perpetrated on it." There lived in Mexico City in 1790 a historian named Antonio de Leon y Gama who had spent a lifetime studying ancient documents and had mastered the Nahuatl language and learned to interpret some of its hieroglyphs. Antonio de Leon y Gama, then in his fifties, recognized the stone as the famous Aztec calendar, of which Siguenza had written of. To Leon y Gama the discovery of the calendar proved beyond a doubt, that the pre-conquest indians had possessed an advanced and remarkable knowledge of mathematics and astronomy. Which they used to make accurate observations of the movement of the suns, planets, and stars to produce a calendar with 52 cycles each with 365 days, each divided in 18 months with 20 days in each month, where they added 5 days on regular years and 6 days on leap years. In a monograph explaining the sun stone, Leon y Gama tried to show how falsely the ancient Mexicans had been described as "irrational and simpleminded beings." His explanation was too embarrassing for the Spanish clergy. Without elementary notions of astronomy, they continued to insist that the "calendar stone was a sacrificial altar," arguing that the very fact that "intertwined recurrent cycles were put together in such a complex and aesthetic manner meant they were ornamental, using as evidence the fact that the same symbols appeared on earrings, necklaces and other purely decorative objects." Leon y Gama pointed out, clearly and for the first time, that the Aztec and the European calendars are responses to very different concepts. This insight meant that he frequently hit the mark, despite occasional errors in his hypothesis, which were corrected throughout the course of the nineteenth century by later archaeologists. Leon y Gama recognized the great Aztec stone as a sophisticated calendar. He believed its central cloverleaf design represented the legendary Aztec epochs of the four suns. In the third circle he recognized the twenty Aztecs symbols for the days of the month and the hieroglyph for four-ocelot, the day when the sun stood at the zenith over Mexico City. As for the two enormous snakes around the outer edge, Leon y Gama believed they represented the Milky Way. In the center of the Stone of the Sun is the face of The sun, called Tonatiuh, was invoked by the names of "the shining one," "the beautiful child,"" the eagle that soars." At the sides appear his hands, tipped with eagle claws clutching human hearts, for the sun was looked upon by the Aztecs as an eagle. In the morning, as he rose into the sky, he was called Cuauhtlehuanitl, "the eagle who ascends." In the evening he was called Cuauhtemoc, "the eagle who fell," the name of the last, unfortunate, heroic Aztec emperor. Around the figure of Tonatiuh there are sculptured in large dimensions are the symbols of the Aztecs four-epochs. On the top right the Jaguar Sun (Ocelotonatiuh) symbolized the first of earth's four epochs. It was believed that this era the world was inhabited by giants that were devoured by jaguars. The jaguar is adorned with a "smoking mirror," the symbol of the god Tezcatlipoca. On the top left the Wind God (Ehecatonatiuh) symbolized the second era. At it's end humanity was destroyed by hurricanes and the survivors transformed into monkeys. The God of this era is Quetzalcoatl. The third era on the lower left of the center is the Rain(Sun-Quiauhtonatiuh). Tlaloc the god of rain and celestial fire reigned over this period. It was believed that humanity was then destroyed by a rain of fire. The men who survived were converted into birds. On the lower right on the center is the forth epoch, represented by the Water God-Atonatiuh. At the end of this era it was believed that Humanity was exterminated by a flood and the survivors turned into fish. This epoch is represented by a vessel of water, and the goddess Chalchiuhtlicue. The Aztec Stone of the Sun is now the showpiece in the Mexica room of the Museo de Antropologia in Mexico City. 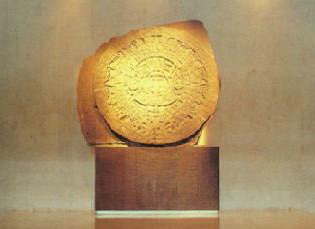 the Stone of Sun has become a national symbol of Mexico. Archeologist Zelia Nullal described the Stone of the Sun as "the most precious and remarkable monument ever unearthed on the American Continent," and "one of most admirable and perfect achievements of the human intellect."